On to Annapolis – pt 1. 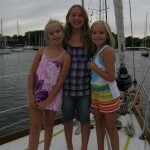 One of our long anticipated milestones for this trip was making it, by boat, to the US Sailboat Show in Annapolis MD. 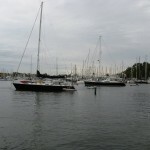 For the benefit of non-sailors, Annapolis is a sailing Mecca on the US east coast and the annual sailboat show there on the Canadian Thanksgiving weekend is the largest sailing exhibition in North America. It’s a big event, and to come there by boat was something we had long anticipated. Monday morning, Oct 5, we pulled up a very muddy anchor and chain and motored down the Sassafras River back to the Chesapeake proper. After about a 7 mile motor downstream, but upwind, we turned to port and found ourselves on a lovely starboard tack reach heading toward Annapolis. The wind was only about 10-12 knots, but the tide was falling (in our favour) so we were able to make a pretty consistent 7 knots over the ground. (6.5 through the water plus 0.5 tidal current = 7 over the ground). The weather was nice – 70-ish, the water was flat due to the narrowness of the northern part of the bay, and Bojangles was sailing flat and fast. Pretty much a perfect sailing day. Too soon, we sailed beneath the Chesapeake Bay Bridge that connects the mainland to the Delmarva Peninsula and made the starboard turn into the Severn River and Annapolis. We navigated our way to Back Creek – where we planned to anchor. When we entered the creek, there were marinas full of sailboats lining the creek on either side and the middle of the creek was loaded with sailboats anchored much closer than I’ve ever seen boats anchor. After a few minutes of being intimidated by the tight quarters, we were able to scope out a spot where our 50’ ketch might be able to swing on an anchor chain without crashing into shore or neighbouring boats. Once we dropped out hook, it became clear that we were quite close to our neighbour ‘Worthless Wench’. By close, we could have easily tossed a dockline from our boat to his had the occasion arose. To attempt to dissipate the inevitable tension and the discussion around whether we were anchored too close, Kathleen, upon making eye contact with our new neighbour, immediately invited him to come over for a beer. Nothing breaks the tension like a cold Heineken. As it turned out, Bill from Worthless Wench was a nice guy and had no issues with our close proximity. We would have to keep vigilant however, because we were really close and if the wind shifted, it was by no means clear that we wouldn’t collide. A couple of days later, the wind was really honking – about 20-25 knots in the anchorage itself. Our anchor chain was stretched bar tight and I’d be lying if I said I was 100% confident that our anchor wouldn’t drag. Because of the crowded anchorage, I didn’t have as much chain out as I would have liked. I did though, have a 66lb Bruce anchor that had been on the bottom for 48 hours, so it should have been well set by this point. Around midday, a boat close to us, Sapphire, was resetting its anchor and I was watching his progress as anchoring a 50+ foot boat in a crowded anchorage in 20 knot winds is not the simplest exercise. Whilst Sapphire was re-anchoring, I popped below for a moment. When I came back up a minute later, I didn’t see Worthless Wench, which had been right off our transom. My first thought was that we had started dragging. I looked around and confirmed that we hadn’t dragged – but where was Worthless Wench? He couldn’t have pulled his anchor and left that quickly. Then I saw the boat. Down to leeward, Worthless Wench was drifting amongst boats in the anchorage heading for the docked boats at the marina about 100 yards downwind – and there was no one aboard! I jumped in the dinghy and, with the help of a couple other alert folks in the anchorage, we were able to use our dinghies to direct this 30,000 lb boat onto the end of a dock and tie her up with fenders and lines borrowed from neighbouring boats. Amazingly, this boat had drifted through the anchorage without hitting any other boat or suffering damage itself… Sometimes, you get lucky. This entry was posted on Monday, October 12th, 2009 at 9:22 pm and is filed under Uncategorized. You can follow any responses to this entry through the RSS 2.0 feed. You can leave a response, or trackback from your own site.